Info "Pull those things off her head!" Metroid is a microgame found in international versions of WarioWare: Touched! in the Retro Action stage. It is based on the NES game Metroid. It replaces the game Famicom Tantei Club 2 from the Japanese version, which features completely different gameplay. The objective is to drag the Metroids away from Samus or Zero Suit Samus. 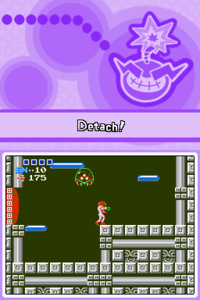 1st level difficulty: The player must drag away one Metroid. 2nd level difficulty: The player must drag away two Metroids. 3rd level difficulty: The player must drag away three Metroids. This page was last edited on February 17, 2018, at 15:33.